So here’s what I didn’t want to get into in the main review, because it happens so late in the film that it feels like a major plot spoiler, even though the plot doesn’t really start until it happens: The magic Merida gets from the witch turns Elinor into a bear. She can’t speak, so she can’t interrupt Merida, so she finally starts listening to her. She gets to see firsthand how competent her daughter is in the wilderness, and how well she carries herself. And Merida gets to contemplate actually losing her mother, and realizing just how painful that would be. Meanwhile, Fergus thinks bear-mom is actually just a wild bear who killed real-mom, and he starts hunting her down out of grief and fury. This is all very well-done, and it leads to the terrifying confrontation and the strong emotional moment at the end, but it’s strangely familiar from a previous Disney film, Brother Bear. That film also had its problems with storytelling and tonal shifts, but the dramatic core hit some of the same beats about familial expectations and conflicts, and a protagonist who doesn’t like the role tradition chose for him. Plus both stories feature an angry, controlling character who gets changed into a bear and learns to actually pay attention to others’ feelings (and appreciate nature and the wild better) as a result. Then both stories feature a relative who misunderstands the situation and tries to kill the changeling bear. These aren’t exactly vague similarities. All that aside, though, kudos to the filmmakers for the ridiculous gag involving the witch’s household full of wood sculptures. Every single carving involves a bear. As far as we know, all her spells turn people into bears, too. That is one seriously one-note witch. But whether she’s deeply fixated on bears or just has some weirdly bear-specific talents, it’s kind of hilarious that she’s essentially a magical artisan who only works in the medium of bears. And kudos also for the bit at the end where the three clan princes speak up on their own behalf in support of Merida’s argument that people should choose who they marry. 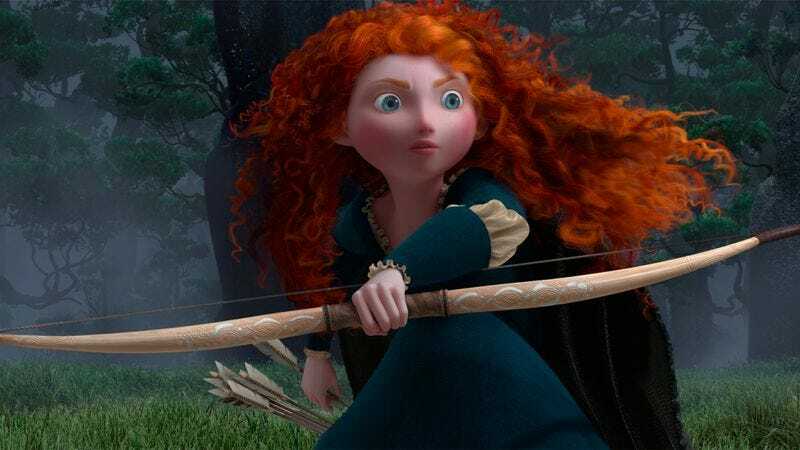 Suddenly, three silly one-note caricatures become people, and suddenly Merida is part of a community instead of being a loner action hero who’s the only sensible person in the world. Now that’s the kind of rare and daring choice that earned Pixar its reputation.